It was during the late 1820s that the new pattern of the Royal Navy Master at Arms' Sword was introduced and it is extremely similar to the pattern and design followed till date. The Sword became more popular in 1832 when a Regulation mandated that Warrant Officers such as Gunners, Boatswains and Carpenters also should have black grips and a stepped pommel. This ruling was in effect until the early 1900s when it was directed that Warrant Officers also should wear the sword with white grips and the lion head back piece similar to the ranks of the Commissioned Officers. A lesser known fact is that the same sword with black grip and rounded pommel must be worn only by the Master' at-Arms rank and is a regulation that stands true even till today. The Royal Marine Sword is influenced by the Infantry Sword pattern of 1897. The straight carbon steel blade of this sword is two-edged for the final section of its length. The crest of the Royal Marines is also engraved on the blade. Blades can be procured in nickel plating as well. 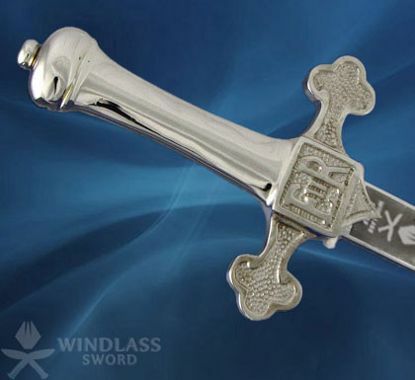 The nickel plated guard is a three-quarter basket hilt, pierced and etched with a scroll pattern that incorporates the royal cypher of the current sovereign. The grip is in black fish-skin normally shark skin with a silver-plated copper wire wrapped in a spiral around it. The Royal Marine's Sword is carried in a Sam Browne leather scabbard with plated steel throat piece for service wear and for full dress occasions. The Royal Air force sword was adopted by the Air Ministry in 1925. Since then it's been carried by RAF Commissioned officers. 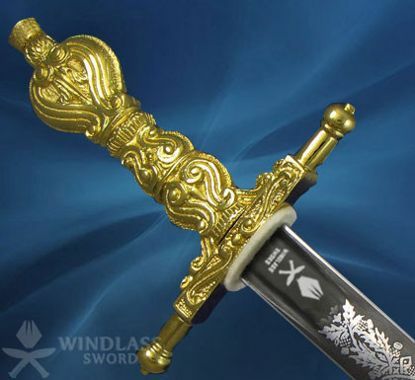 This single edged straight blade sword has a gold plated brass hilt and a white fish-skin grip. The brass pommel on the sword is in the form of an eagle which is elegant to look up upon and is the same bird on the emblem of the RAF. 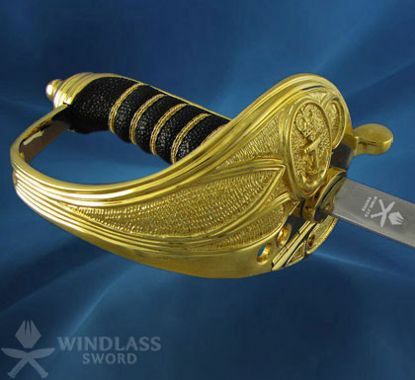 The same emblem can be seen on the gold-plated brass cartouche this sword also hosts. 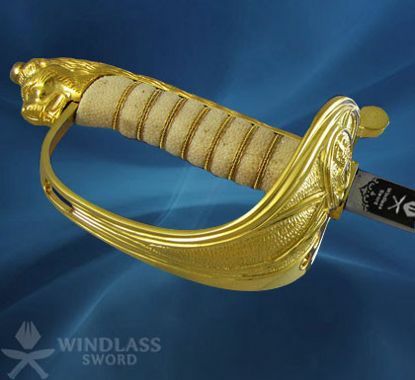 The scabbard which is made up of rawhide with gold plated brass mounts gets more engraved and ornate with every Air rank and above. The Drummer's Sword was his only source of defence during the late 17th century. Since many of the Drummers and Fifers were small in stature, it was necessary that the blades of these swords must be either short or curved like light cavalry sabres so they did not drag on the ground. The cross hilted ‘Romanesque' style sword which was then relegated to Volunteers and Militia was replaced by this Drummer's Sword in 1895.The blade of the sword was shaped like that of the 1888 pattern Lee-Metford rifle bayonet and the pommel was urn shaped in design. The hilt was polished in brass. It was declared obsolete in 1903. Interestingly, the List of Changes of 1901 stated that all swords including the drummers' must be sharpened 'before going on service'. The Military Knights are very well known to wear their own unique specific pattern of sword for all occasions. The design or pattern on the hilt is that of a cruciform. 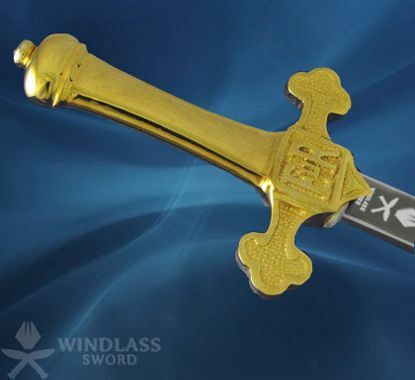 This design is embellished as one piece with the cross guard and its trefoil finials, thus making the Sword truly one-of-a-kind. The entire hand grip is slab sided and the full hilt is drilled and threaded hence allowing the blade to be screwed into it. This fabulous piece of work is carried by means of a cross belt in a black leather scabbard with mouthpiece and chape. Furthermore, the mouthpiece is attached to the cross belt using a stud. All these characteristics definitely make the Knights of Windsor Sword a must-buy. The Royal Company of Archers are the Officers of the Monarch's body guard for Scotland. These officers carry a gilt ornamental cross hilted sword, fitted with a military 'Claymore' blade. Romanesque design can be traced in the hilt. 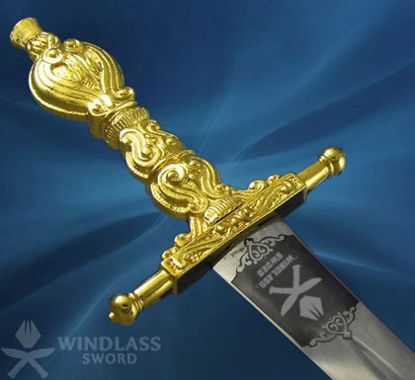 The aureate grip, gothic style pommel and thistle shaped top nut make this sword a mark of pure royalty. The sword is carried in a black leather scabbard which has a gilt affix on the top and chape. 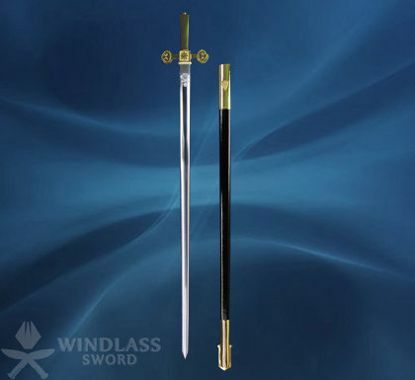 This style is referred to as the 'Field' sword, and thus distinguished from the court sword style carried by officers at the court of the Monarch. The Royal Company of Archers' Sword is generally possessed by the 'Gentlemen' of the 'Company'. A lesser known fact about the Royal Company of Archers' Sword is that it is also referred to as the 'Field' Sword. The Sword has the same hilt as the sword carried by the Officers, however, what sets it apart is that it's blade is shorter and wider making it more sleek and sophisticated. A true essence of Medieval Majesty, the existing design, pattern and style of the Yeoman Warders' Sword was formulated and introduced during the early years of Queen Victoria's glorious reign. 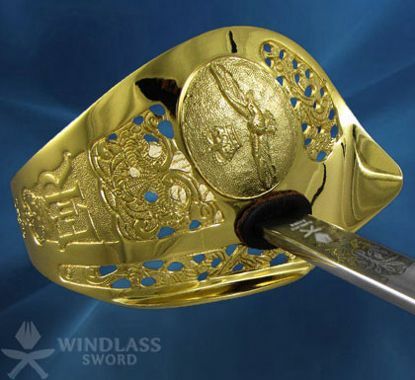 A distinctive characteristic of the sword is that it has a flattened crown pommel and knuckle bow and shell guard embellished with the magnificent Royal Crown glorified by the Lion and passant. 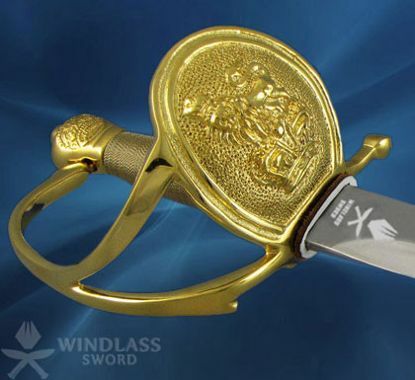 The blade of the Yeoman Warders' Sword is approximately 24 inches long and is borne in a beautiful black leather scabbard with two gilt mounts, thus making the Sword truly a masterpiece. FS Knives are one of those rare knives that have a great history behind them. 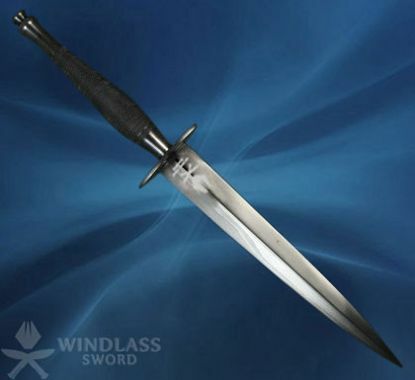 It is said that during the war stricken times of 1940, Captains Fairbairn and Sykes met at the offices of Wilkinson Sword to discuss and revamp the design and pattern of a knife, which later on became popularly referred to as the ultimate Fighting Knife of those times. The knife designed by them post their discussions went on to develop into three different patterns and design (The one depicted in the image is the 2nd Pattern). It is distinguished by a narrowing pointed blade of diamond section which is just 7 inches long. This piece of work has been carefully ground on both edges. Another characteristic of the FS Knife is it's simple cross-guard which was 2 inches wide and remains in design till date. The knife is accompanied in a leather scabbard with a blackened metal chape with an elastic strap retainer and a pair of 'tabs; intertwined to the scabbard, hence allowing the possessor to sew the scabbard into his uniform clothing. A lesser known fact about the FS Knife is that it was never intended as a throwing knife; nevertheless, the FS Knife is perfectly balanced and easy to handle due to its agility and strong build. Definitely being a landmark design amongst knives, the FS Knife as mentioned earlier, brings with it a rich culture, heritage and tradition, hence making it the ever-classic Fighting Knife. We are one amongst the very few manufacturers worldwide to create the FS Knife according to the 1941 drawings and specifications. This pattern of Windlass Gurkha Kurki was the harbinger of existing patterns, slightly shorter and lighter than them. It was introduced in the mid 1960's when The Gurkhas were being issued with the British SLR (Self Loading Rifle) and the Stirling Sub Machine Gun. Our Military Kukris are of two types: the standard issue pattern and the ceremonial pattern. Both of them are made in adherence to the standard of the specifications; size, shape and weight. 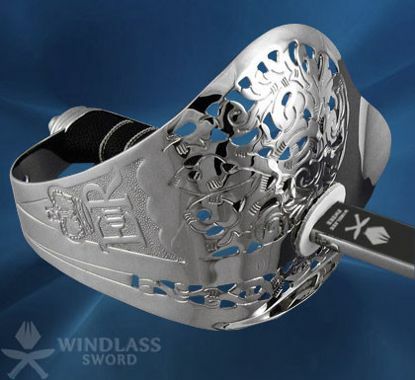 They are designed in an excellent quality with proofed sword steel blade. The Khukuri Knife come with the scabbard and the frog for fastening. The small Karola and the Chakmak are also accommodated in the scabbard. Compact, concise and easy to carry around, the Sgian Dubh is the traditional Highland knife. An unusual fact about Sgian Dubhs is that it is worn in the right sock. However, the Military version of this knife is distinguished by plain white metal mounts coupled with a beautifully hand crafted ebony flattened oval grip, clutched at the front and embedded with studs. The short blade of the Sgian Dubhs has the traditional 'scallop' back and is accompanied with a black leather scabbard with top mount and chape. A definite must-have for any and every collector. The predecessor of the present MK III, Piper's Dirk, was introduced in 1871. It was a Mark II version appearing in 1879 following the Mark III version in 1913. The dirk is issued to the pipers of the Scottish regiments to be borne with No. 1 Dress. 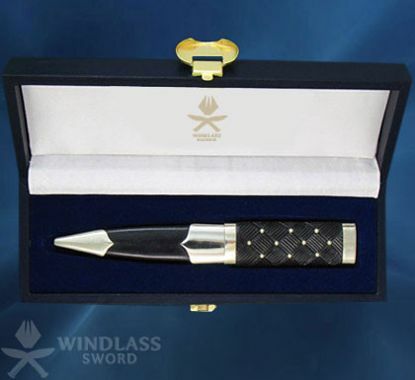 Traditional methods are used to design this thoroughly hand-made dirk. 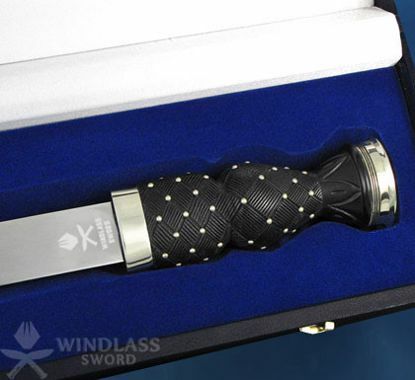 The handle of the dirk is hand carved from ebony, mounted with nickel silver studs. The pommel is also nickel silver, with the elevated Tudor Crown. 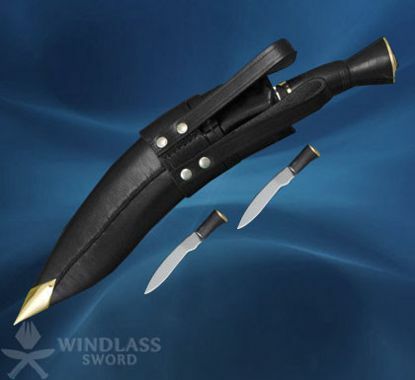 The scabbard is constructed from wood and is covered in leather. The blade on the dirk is of polished sword steel. All the scabbard mounts are in white metal. The blade on the dirk is 11.3/4" long and the overall length in the scabbard is 18". Today, this pattern of dirk is worn by Pipers of The Royal Regiment of Scotland and by Pipers of The London Scottish as well as many Commonwealth Regiments.